Shepard Fairey's famous 2008 Obama "Hope” poster has been the source of countless imitations and parodies. 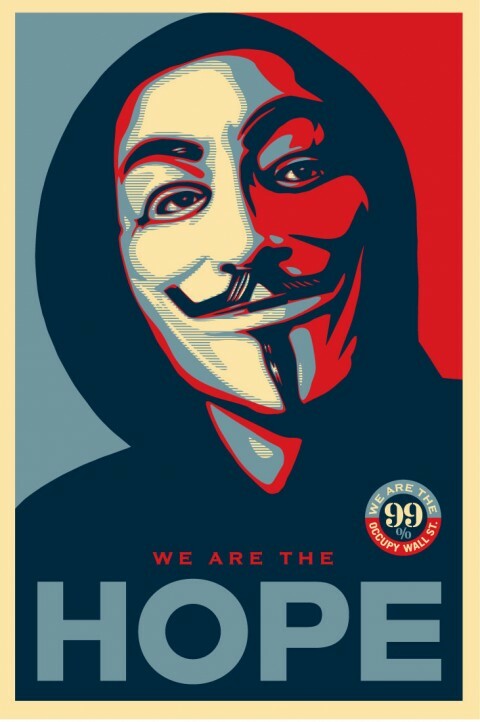 Last week Fairey released his own parody for Occupy Wall Street, replacing Obama's head with a hooded figure in a Guy Fawkes mask, along with the words, "Mister President, We HOPE You're On Our Side." As Fairey explained on his website, "I see Obama as a potential ally of the Occupy movement if the energy of the movement is perceived as constructive, not destructive." Not everyone agreed. Yesterday, after a series of discussions with one of the organizers of the purportedly leaderless movement, Fairey announced he was backing down and dropping the provocative message to the president and replacing it with "We Are The HOPE.” A few of the movement's organizers reportedly thought Fairey's poster implied that Occupy Wall Street either supported Obama or was begging for his support. "As Obama has raised more money from Wall Street than any other candidate in history, it would make us naive hypocrites to support him under present circumstances," the anonymous organizer wrote to Fairey. "As for the design, the fact that you put the 99% inside the Obama O is crossing a sacred line. While it definitely looks cool, whether intended or not, this sends a clear message that Obama is co-opting OWS." "I have no interest in pandering to Obama," responded Fairey. "I see my image as a reminder to him that he has alienated his populist progressive supporters." But Fairey submitted to the pressure and changed his design anyway. You can read more about the exchange here, and see the altered version of Fairey's poster below. Fairey “backed down” and “submitted to the pressure” is your interpretation. They are judgements. OK, here comes a little rant. Firstly, I’m one-hundred per cent behind the 99%. The use of money to undermine democracy ought to be a crime, not the sacrament of some purist vision of capitalism; and income inequality is an existential threat to the country. That said, I hate these masks, which also appeared at Tea Party protests. Do protesters really think they’re doing their cause a favor wearing masks from a comic book and a terrible movie remake? Maybe the comic book was quite good, I don’t know. But the point is that no one takes you seriously in a mask. Furthermore, the grin of the mask makes people think that you think you look cool. Wanna bet most people don’t agree? These masks are perfect, surely you must see that? Never seen Eyes Wide Shut? It could have been any mask, you see? But that one is friendly, intellligent-looking and gives one face to a completely heterogenous crowd because only a mask can symbolize it without personifying it. Thanks Maureen. Maybe I’m wrong. I do see the intelligence, but it looks a little more menacing than friendly to me. Then again, maybe smiles disconcert me in some unusual way. I’ll think about what you said, and maybe check out Eyes Wide Shut again. I don’t know, I think his original message is more powerful. Not only did Obama let down those who supported him but he’s also in a better position to change it – certainly the Republican won’t. Maybe if said “Hope you do what’s right” rather than appearing to ask for support it would have been less contentious.